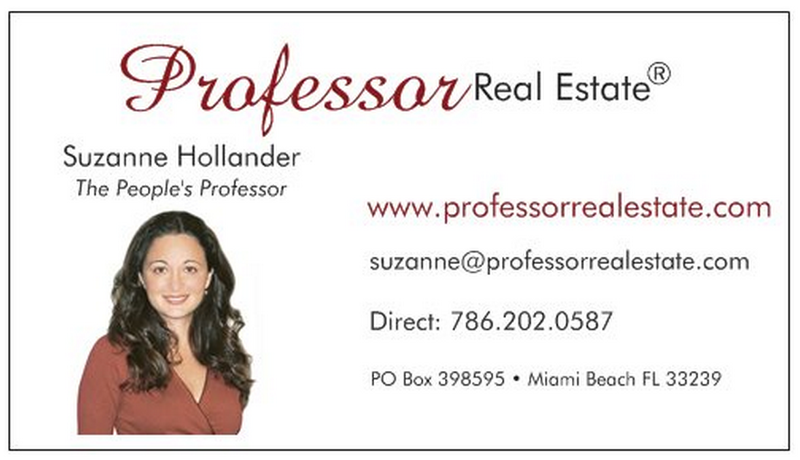 Contact Professor Real Estate® Suzanne Hollander for real estate brokerage services, commentary and empowerment. To buy or lease property in Florida or Maryland contact Suzanne Hollander. She is a licensed real estate Real Estate Broker in Miami, Florida with Hollander Realty LLC and a licensed Real Estate Sales Associate in Maryland with EKB Realty. Watch, YahooFinance!, Miami Herald, El Nuevo Herald, Wallethub, The Real Deal, Mercado De Dinero USA & Scotsman Guide Commercial Real Estate edition. Watch Professor Real Estate®TV for a sneak peek of some real estate lessons! Disclaimer: Professor Real Estate® written materials apply generally to real estate subjects and are not intended to apply to specific legal issues. Copyright 2016. Professor Real Estate® Suzanne Hollander. « Yahoo!Finance Quotes Suzanne Hollander On Buying Property with Friends! > Build Urban City > In BizNews! Suzanne Hollander Leads Downtown Miami River Real Estate Boat Tour!